We source our Calasparra Rice from a small farm of only 50 hectares in EI Puerto, in a high fertile valley bordering on the Segura River. The farm is operated by Juan Haro and his sons. They have just six other employees so every part of the farming process is carefully watched over by the family to bring you the best Calasparra Rice possible. All rice is dehydrated naturally in glorious Spanish sunshine to enhance both the taste profile and the hardness of the rice. The certificate of origin or "Denomination of Calasparra Origin" is only given to farmers who meet exacting standards, proving authenticity and as an endorsement of hgh quality Calasparra Rice. 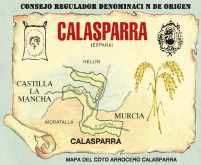 Calasparra Rice is renown in Spain and is becoming increasingly popular amongst enthusiasts of Spanish cooking worldwide. Our Calasparra Rice is a white round grain rice of excellent quality, which increases its length and thickness by up to 60% when cooked, soaking up three parts of water to one part of rice, making it the best rice to use when cooking Paella.